Thank you for visiting our online shopping site! We would like to provide you with some information to help with the ordering process. PLEASE NOTE: Our online shopping site is reserved only for at home consumers who wish to purchase our Wellshire and other family brand products, but do not have access to a local grocery store. If you are a commercial establishment looking to purchase products for resale, please contact our office at 877-467-2331 and one of our customer service representatives will be more than happy to assist you. Thank you for shopping with us! All orders ship from our warehouse in Logan, NJ. Any shelf stable product ordered will be shipped UPS GROUND. We adjust this internally and will email you the new adjusted total after your order has been processed. Our orders are processed first thing in the morning (8:00 AM EST). Any order received after this time will be processed the next business day. Our delivery schedule does not ship over the weekends. Any orders that can not be shipped within 2 days received on Thursday or Friday will be sent out the following Monday. The delivery schedules also changes with all legal holidays. Wellshire thanks you for your patronage, and we hope that you continue to enjoy our products. We want you to feel great by eating well!! 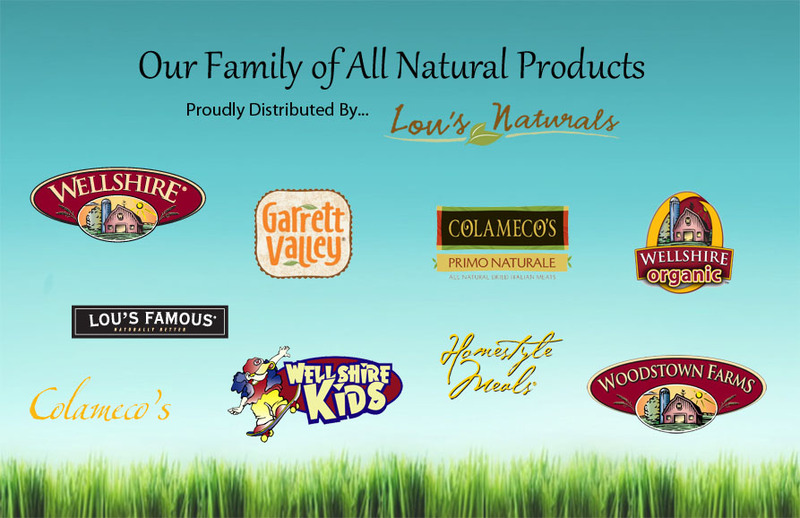 Lou's Naturals' Family of All Natural Products - This store is powered by ShopSite web catalog software.